Are you hosting family for Easter dinner this year, or contributing to a holiday potluck? There are endless Easter side dishes that each add something special to the celebration and are sure to please hungry guests. From scalloped potatoes and roasted asparagus to light spring soups, casseroles, salads, and more, these winning recipes will taste great beside your favorite Easter main. 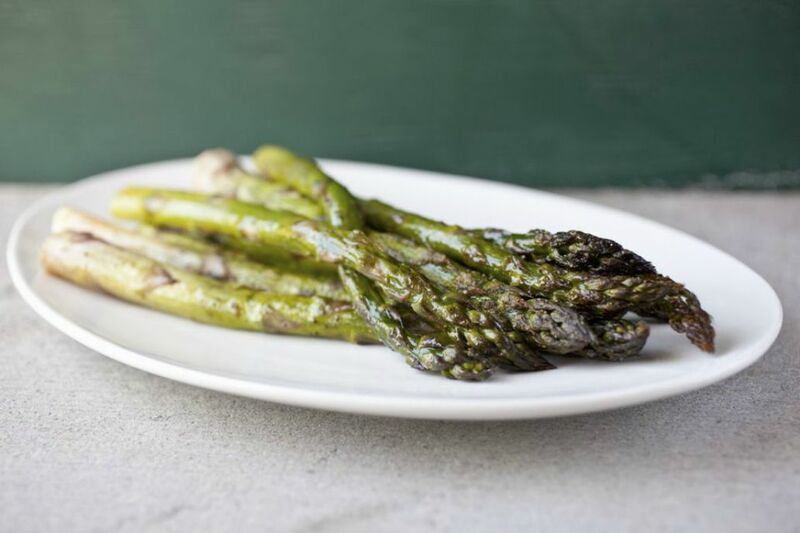 There are few better ways to prepare asparagus than tossing it simply with olive oil and sea salt, then roasting the spears quickly in the oven, like in this easy recipe. Serve up a creamy French-style gratin that's a little different this Easter. This elegant casserole swaps out potato in favor of steamed cauliflower and layers the vegetable between a rich, thyme-seasoned bechamel sauce, and plenty of cheese. It's baked with a crunchy breadcrumb topping. Crock pot scalloped potatoes are a real time-saver when you're putting together a holiday dinner. They also free up your stovetop and oven for other dishes. Assemble the ingredients easily in the morning for a side dish that's ready when you are: all it needs is a last-minute sprinkling of extra cheese and optional fresh herbs. Palate-pleasing buttered leeks are simple to prepare and make a versatile side dish that tastes great with ham or lamb. The vegetables simmer for about 30 minutes on your stovetop in butter and sea salt until tender and ready to enjoy. Roast carrots and parsnips simply in the oven with olive oil and chopped fresh herbs in this budget-friendly recipe. The root vegetables are a wonderful accompaniment to roasted meat dishes. Scalloped potatoes are always an Easter favorite. This rich and creamy potato bake with Parmesan cheese delivers all the flavor and texture you expect, with a visually appealing golden-brown crust on top. Spaghetti or linguine tossed with a fresh, garlicky spinach pesto makes a fabulous spring side dish. Serve it alongside your holiday turkey, chicken, or roast pork. Dress up green peas with tangy feta cheese, citrusy sumac, and a little olive oil, for a fresh side dish that takes only 10 minutes to prepare. Homemade bread truly takes a holiday celebration to the next level. These soft yeast rolls are finished with a light egg wash and topped with sesame seeds or poppy seeds. Serve warm with butter, and watch them disappear. Wild mushrooms are plentiful at spring farmer's markets, and this quick and easy recipe makes the most of their fresh, earthy flavor. Just brown them in a pan with olive oil, shallots, garlic, fresh herbs, and a splash of white wine. Fluffy mashed potatoes are a snap to prepare in about 15 minutes, using an Instant Pot. The spuds cook in the appliance while you prepare the other ingredients for a side dish that comes together quickly. Focaccia is a soft, airy Italian yeast bread made with olive oil. It's best eaten on the day it's baked, which you can do, including assembly, in about an hour. Be sure to include a couple of hours in your prep time for the dough to rise, too. Whip up a quick and easy side dish for holiday entrées with this easy, colorful, 3-ingredient recipe that's ready in 10 minutes. Baby carrots, frozen peas, butter, salt, and pepper are all you need. In-season strawberries add something special to this beautiful spinach salad. Along with olive oil, lemon juice, and Dijon mustard, the lively dressing includes honey and cinnamon for a hint of sweetness and spice. This rice pilaf is a tasty baked dish made with onions, garlic, and frozen green peas. Add cheese and sour cream at the end of cooking for a tangy flavor and great creamy texture. Corn casserole is a traditional holiday side dish, and this colorful recipe is sure to be a crowd-pleaser. Make a rich, creamy sauce from condensed soup and sour cream, and top the entire dish with buttery Ritz cracker crumbs. Simple can still be impressive, as this elegant roasted potato dish demonstrates. Toss potato cubes with olive oil, chopped fresh rosemary, salt, pepper, and optional garlic powder, then baked in a hot oven until soft and sizzling. Macaroni and cheese makes a great side dish for Easter entrees. This super-creamy version combines American and cheddar cheeses with Dijon mustard and light cream for a dish sure to disappear quickly. Broccoli and cheese are always a popular combination, and this recipe serves the perfect pair up casserole-style for the holidays. Use buttery crumbs for the topping to add plenty of flavor and texture. Serve this impressive cheese souffle to wow your guests at Easter — it's simpler to make than you might expect! This recipe walks you how to create a simple, light-tasting cheese souffle. Elevate your holiday plate with these French-style duchess potatoes. Pipe mashed spuds onto baking sheets and brush with egg wash to brown in the oven. Make them ahead if you like, and freeze for simple reheating. Dish up flavor and nutrition with this nutty quinoa and roasted cauliflower salad, which gets extra crunch from toasted almonds. Best of all, it's delicious served warm or cold. Dress whole artichokes lightly in olive oil, salt, and pepper, stuff with garlic cloves, and wrap in foil packets to roast in your oven for a pretty, seasonal vegetable side dish. Deviled eggs are an Easter favorite, and this is the classic recipe everyone enjoys. Kids can help you prepare the easy side dish or appetizer, since it only calls for a handful of basic ingredients. 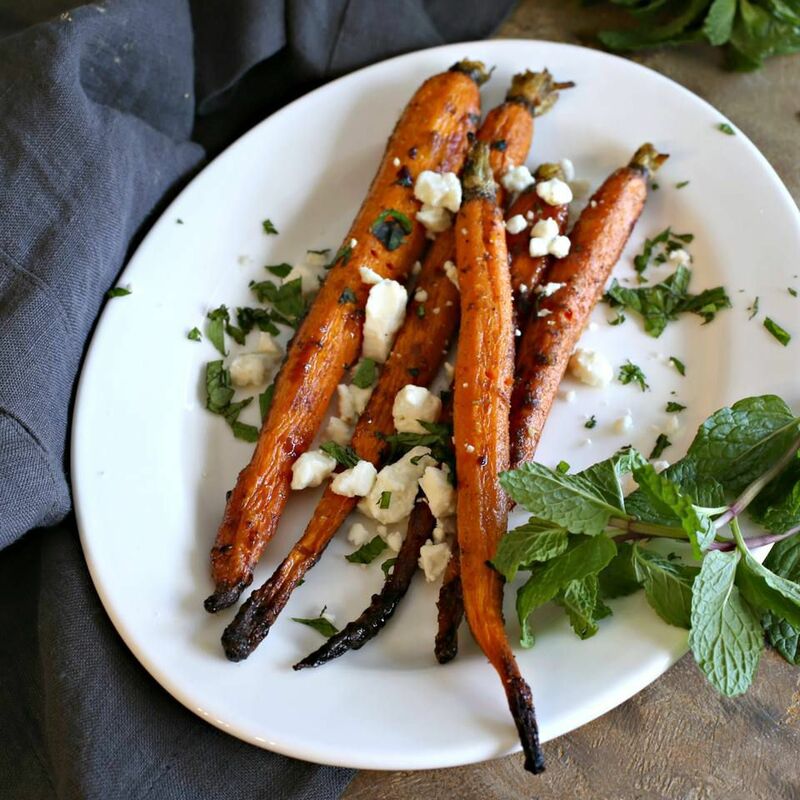 Honey-glazed carrots flavored with herbs and spices inspired by Moroccan cuisine are absolutely holiday-worthy. Cumin, ginger, coriander, and cinnamon mingle with salty crumbled feta and fresh mint for a perfectly balanced bite. Italian risotto makes for a nice upgrade from basic grains, and this seasonal recipe with creamy arborio rice, Parmesan cheese, asparagus, and green peas makes a lovely spring side. Serve this pureed vegetable and herb soup as a refreshing starter for your Easter meal. You can whip it up in about 30 minutes and it tastes delicious warm or chilled. Top with a dollop of sour cream, drizzle of olive oil, or garlicky croutons. Hot German potato salad gets its distinctive flavor from bacon and a tangy mustard vinaigrette. Use red-skinned or Yukon gold potatoes for best results with this recipe. Vegan chickpea and couscous salad packs in plenty of protein. Make it up to two days ahead and store in the fridge, tossing it gently to wake up the flavors before serving chilled. Macaroni salad with chopped fresh vegetables, hard-boiled eggs, and a tangy mustard-and-mayonnaise dressing is a popular side for baked ham. You can prepare this chilled salad a day ahead, storing in the fridge until ready to serve. Bring French sophistication to your Easter table with this classic bistro recipe for green beans with almonds. It comes together in 10 minutes on your stovetop, and the simple butter, lemon, and garlic sauce adds great flavor to the snappy beans. Slow cooker carrots simmer for hours in a delectable sauce made with brown sugar, butter, orange juice and zest, cinnamon, and nutmeg. It's an easy and flavorful side dish to serve with Easter ham or pork roast. Leek and potato soup is a classic British recipe that's special enough for the holidays. It's also easy on your budget, and has a pleasing mild flavor and luxurious silky texture from pureed potatoes and heavy cream. Celebrate seasonal spring flavors with this tasty side that calls for fresh in-season asparagus and mushrooms. Cook them simply on a grill pan in your oven with olive oil, salt, and pepper, for a savory side. Crunchy raw fennel combines beautifully with ripe, creamy avocado in this snappy salad. Serve it as a fresh component alongside roasted meats like ham, pork, or beef. In this easy recipe, garlic and Parmesan cheese impart extra savory flavor to buttery mashed potatoes. The garlic cooks right along with potatoes, so there's no extra step needed to infuse its flavor. Green garlic (also called garlic scapes) is plentiful at farmers' markets in late spring and adds its subtle zippy flavor to this elegant risotto. Serve up a side of spring with this refreshing salad, featuring asparagus, soft butter lettuce, and a simple vinaigrette. The veggies are topped with fresh mozzarella and pistachios, making it special enough for holiday dinner. Spinach baked in a homemade white sauce with onions, Parmesan cheese, and a buttery breadcrumb topping makes an elegant side dish, perfect for pairing with your holiday ham. Fresh lemon juice adds lovely brightness to this light and creamy asparagus pasta. Use a long noodle shape, such as spaghetti or fettuccine, for an elegant presentation. A colorful, tangy red cabbage slaw with red onions, raisins, and pecans makes an attractive addition to your holiday dinner table. Serve it as a side for baked ham and other roasted pork entrees. Looking for a protein-rich, savory side dish for vegetarian guests? This recipe includes meaty mushrooms to amp up the flavor of naturally nutty pearl barley seasoned with scallions and fresh herbs. Omit the optional parmesan to make it vegan. This vegetarian- and vegan-friendly carrot soup makes a warming, nutritious starter for your holiday meal. Ginger and orange juice add fresh flavors to the bowl. Creamed peas with thinly sliced mushrooms and onions make a great complement to Easter lamb or pork. If you prefer a thicker sauce, you can replace some of the vegetable broth with milk or heavy cream. Saute Arborio rice in pancetta drippings and cook in the traditional manner for this seasonal spring risotto with bright green peas added at the end of cooking. Kids can help you prepare this twice-baked potato that's fun to make and delicious to enjoy. Bake potatoes, then scoop out, mash with butter and sour cream, and stuff back into shells. Bake again to brown the tops, and serve to your favorite potato-lovers. Celebrate the fresh, peppery flavor of spring watercress with this simple, delicious chilled soup that's creamy and bright-tasting. It's sure to be a palate-awakening first course for your holiday meal.